What's the Ideal Ceremony Start Time? How Much Wedding Coverage Do I Need? This Bay St. Louis Mississippi wedding ceremony took place at Our Lady of the Gulf Catholic Church. 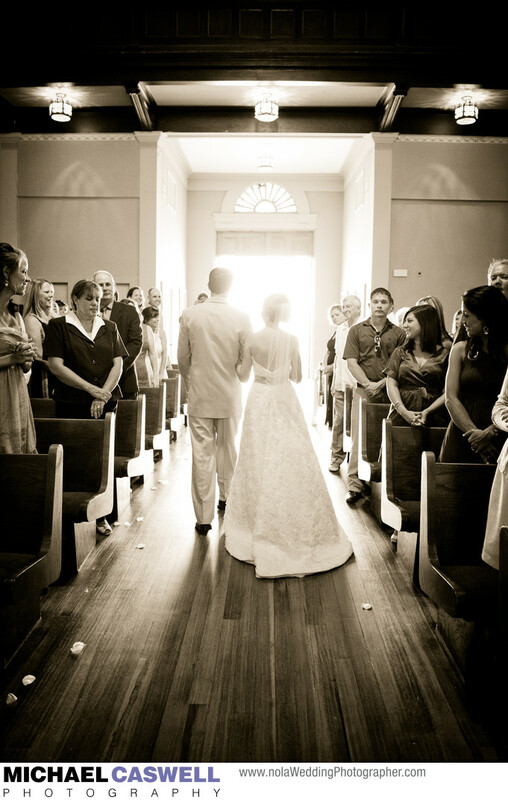 I love the brilliant daylight streaming in through the open church door in this photograph, washing over the newly married bride and groom as they walk down the aisle, which gives this image an ethereal, heavenly glow. This is a black and white photograph, with a bit of a sepia tone added to give it a slightly aged and classic look that I thought beautifully complimented the strong backlighting of the open door. This couple's wedding reception was held at the nearby Bay St. Louis Community Hall, a very nice venue, spacious enough for even very large gatherings. Location: Bay St. Louis, Mississippi.